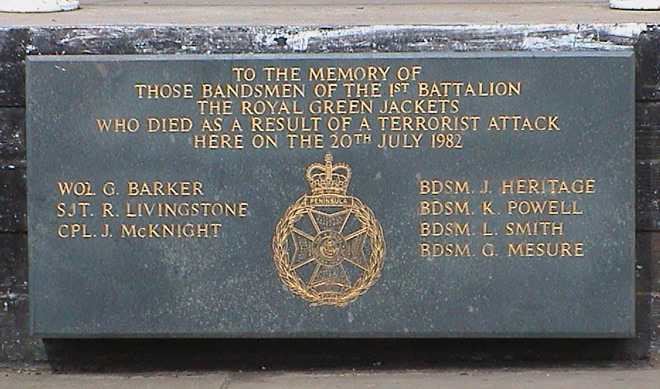 To the memory of those bandsmen of the 1st battalion, the Royal Green Jackets, who died as a result of a terrorist attack here on the 20th July 1982. We thank our colleague Andrew Behan for researching the names on this memorial. 2016: We attended an event at UCL at which reference was made to this memorial and the use of the word 'terrorist'. The PhD student making the presentation pointed out that this language expressed a political point of view with which many Irish people (of which he was one) would disagree. This made us examine the memorials on London Remembers. We use 'terrorism' as a category title, to enable interrogation of our data. Using our Advanced Search we found 9 subjects (mainly events) with this category, commemorated on a total of 23 memorials, of which only 4 use the term 'terrorist'. These are: the two for the Hyde Park bomb, one for the 9/11 attacks and this one. Not one of the 9 memorials for the London 7 July bombs uses the word. When we use the word we don't intend any political statement. We have memorials to many bomb attacks on London, and we need to differentiate war-time bombs from these random, unexpected attacks. Also, the word, surely, is descriptive of the intention of the bombers - to create terror in a civilian population. Used in this sense the word is not political. We're beginning to feel we're in difficult territory and would happily use another word for our category, but it needs to be easily understood and we doubt there is another one. Born in Bedford. Died aged 31 years, killed by the IRA Regent's Park bomb.